Reichert is a motion pictures professor at Wright State. 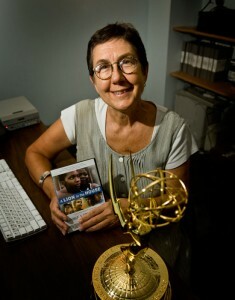 Her documentary "A Lion in the House" won a 2007 Emmy® Award for Exceptional Merit in Nonfiction Filmmaking from the Academy of Television Arts & Sciences. In 1971, the modern women’s movement was picking up steam. Women across the country were talking about feminism and oppression. In this climate of revolution, Wright State University film professors Julia Reichert and Jim Klein produced the first feature-length film of the movement. On Oct. 24, Growing Up Female will be screened at the Lincoln Center for the Performing Arts in New York City. The film is also in the running for inclusion in the Library of Congress’ National Film Registry. Growing Up Female looks at female socialization through the lives of six women, age 4 to 35, and the forces that shape them, including teachers, counselors, advertising, music and marriage. The film was widely distributed for decades. It was recently restored to a new 16mm print with a grant from The Women’s Film Preservation Fund, a project of New York Women in Film & Television. “It is wonderful to experience a new birth—a new life—for this film, which is now seen as a classic,” said Reichert. Earlier this year, the film was shown at the Museum of Modern Art in New York City, and the American Film Institute in Washington, D.C. It has been nominated for inclusion in the National Film Registry each year for the past five years and has advanced to the list of finalists twice.